We are pleased to have arrange an exclusive meeting for qualified entrepreneurs and investors to meet with Mr.Bruno Delfante on the 15th of May 2017 in our office. Mr Bruno Delfante, Manager, Western Australia Business Migration Centre and Small Business Services at Small Business Development Corporation Western Australia. He manages the State Government’s nominations for the Business Innovation and investment Program. He also provides information and advisory services of the Small Business Development Corporation to establish and develop businesses in Western Australia. We are proud to be hosting a seminar with the New South Wales Department of Industry who is in Malaysia for the first time. 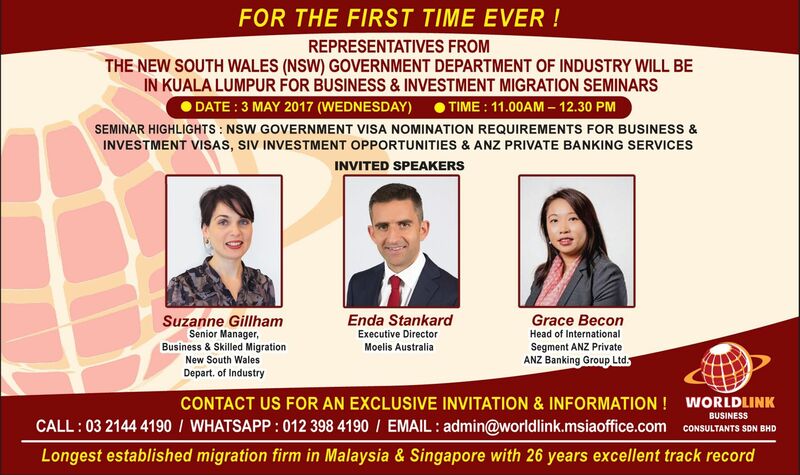 The seminar is catered for Business and Skilled Migration applicants and will be held in Kuala Lumpur on 3 May 2017. This seminar will provide further insight on New South Wales which is the oldest state in Australia. 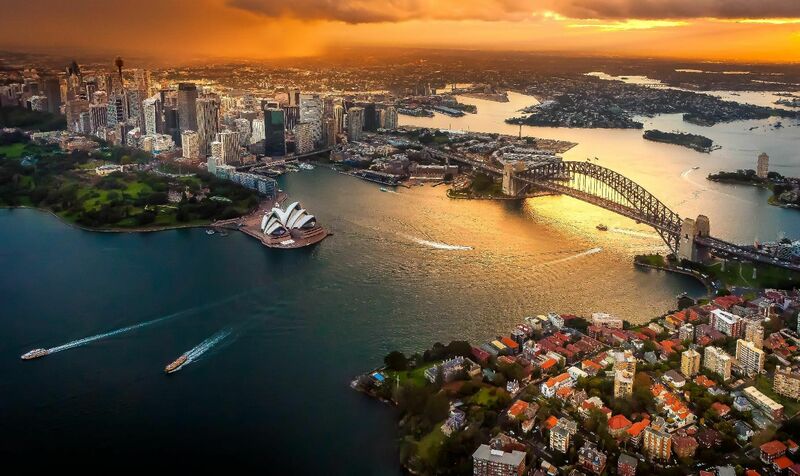 The capital city, Sydney, is rated as one of the world&apos;s most glamorous cities that welcome migrants who are keen on investment and settlement. To further enhance your time with us, we have invited special speakers from Moelis & Company and ANZ Banking Group Limited to provide insight on investment opportunities, wealth management and private banking facilities in Australia. With our clients interest towards property development business in Western Australia. 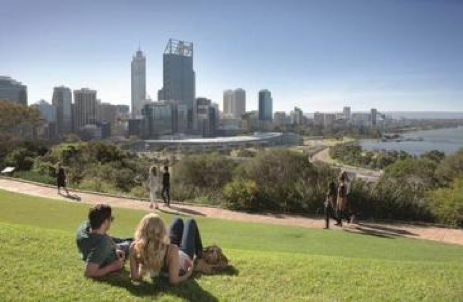 We have organised an exploratory trip to assist them on understanding the property market in Western Australia. 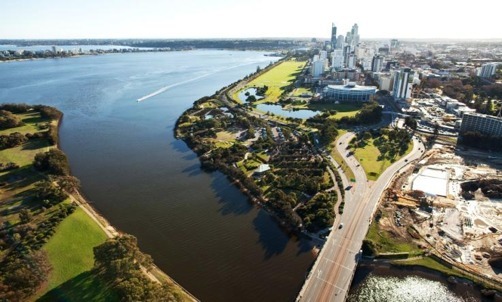 We have made arrangements for meetings and project site visitations with some renown developers and accounting firm in Perth on 2nd and 3rd March 2017. Apart from that, arrangements for the participants to meet up with the Small Business Development Corporation, Government of Western Australia has also been made to understand the government policy for their migration visa. This will allow our clients to have an insight towards property development in Western Australia and the requirements for visa. Ms Lucy is one of the senior officers in the Small Business Development Corporation that review and approves sponsorship for business migration application to Western Australia. M/Group is an established integrated property group with interests in development, construction, investment, and real estate services. The M/Group comprises five business units; Match, M/Property, M/Construction, M/Finance and M/Land. The M/Group holds an Australian Financial Services License and has opportunities for retail, corporate and institutional clients. One of the project that is currently under MGroup is located at North Coogee (a prominent AUD4.9 billion govt redevelopment area) which is between South Beach Estate Precinct and Port Coogee Marina. The proposed development is a 2 boutique projects with 28 apartments [total 56 residential apartments comprising of 1 & 2 bedroom apartments] and 17 strata land lots to be sold as house and land packages. Nicheliving is a dynamic and multi-faceted property group offering comprehensive services across new home & land and apartment developments, project marketing, construction, financial services, real estate sales and property management. With a property portfolio in excess of $500 million, they are one of the well-established Western Australian company. Moore Stephens WA is an audit, accounting, tax and advisory firm that enables clients to operate at their very best. They deliver the personal attention and local market knowledge you want, backed by a leading national and international association of expertise, knowledge and advice you may need to succeed. KordaMentha is an advisory and investment firm that provides Restructuring, Turnaround, Real Estate and Forensic support for companies and their stakeholders. KordaMentha was established in 2002 shortly after we were appointed as administrators over Ansett, the largest voluntary administration in Australian History. Since then, we have grown from a heritage in insolvency to become one of Australia’s foremost multidisciplinary advisory and investment firms with prominent forensic, real estate, corporate turnaround and restructuring practice. This networking session is exclusively for all our business migration clients to Victoria with collaboration with Mitraland Australia on their newly launched Esque Project located at South Yarra, Melbourne, Australia. Esque is a 20 level residential tower within South Yarra’s Forrest Hill Precinct. 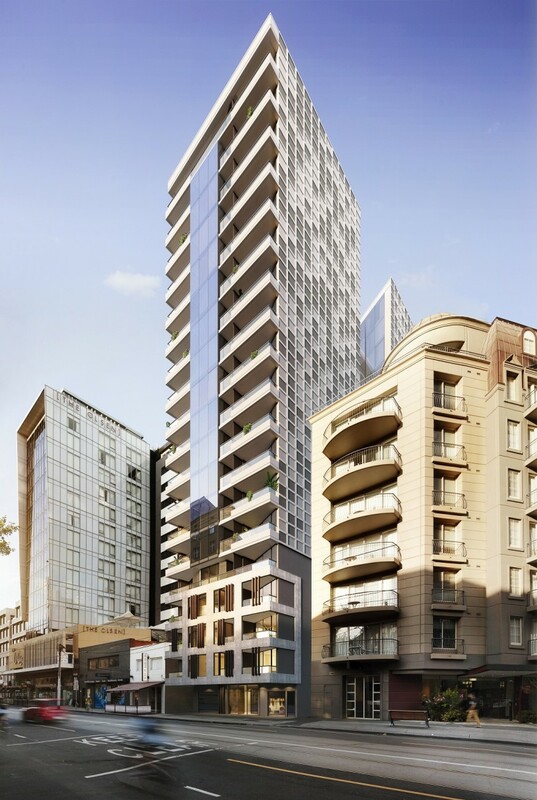 Designed by Fender Katsalidis, the 61-metre high tower at 649, Chapel Street is expected to have an end value of approximately $50 million. The tower would have 72 two-bedroom apartments, 71sqm of retail space at ground level, 44 car parks and 21 bicycle spaces located within three basement levels and a communal rooftop space with a barbecue area and roof garden. 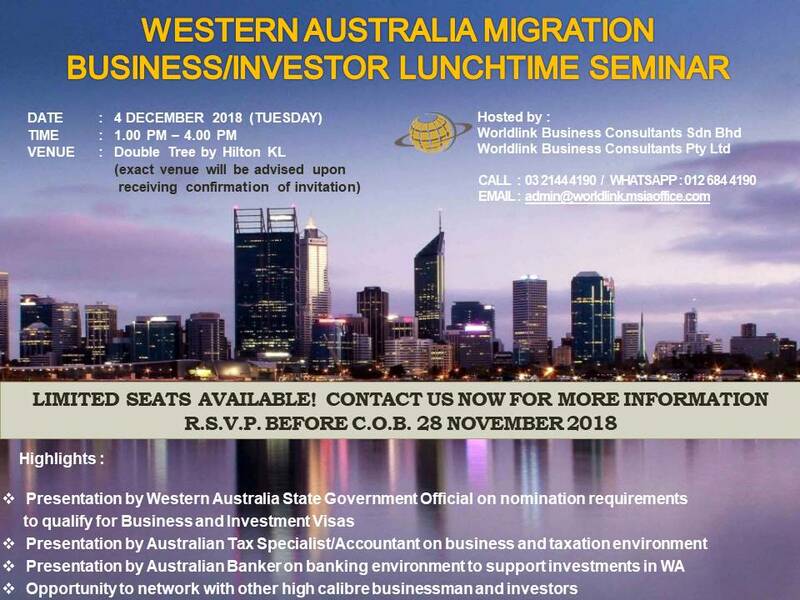 We are delighted to invite you to an exclusive Western Australia Business Migration Seminar by the Small Business Development Corporation, Government of Western Australia catered to our Business Clients on the 22 November 2016. For your information, the Small Business Development Corporation is a Western Australia Government agency that delivers relevant, practical support to small business since 1984. Their primary role is to offer free, confidential advice to small business starters and owners. Mr Delfante manages the State Government’s nominations for the Business Innovation and investment Program through the Business Migration Centre and the information and advisory services of the Small Business Development Corporation to establish and develop businesses in Western Australia. We are pleased to inform that we had specially invited Mr James Tng, Director, Taxation and Business Advisory, Moore Stephens Western Australia to provide advice on accounting and taxation in a one-to-one private session with our selected clients on 8 - 9 November 2016. Moore Stephens WA (website : http://www.moorestephens.com.au/locations/western-australia) is an audit, accounting, tax and advisory firm that enables clients to operate at their very best. They deliver the personal attention and local market knowledge you want, backed by a leading national and international association of expertise, knowledge and advice you may need to succeed. Mr James Tng has been a partner since 2006. He has decades of experience in tax and business advice to businesses, migrants, overseas and Australian businesses and government agencies. James generally looks after the ongoing tax affairs for clients with complex tax issues and has extensive knowledge and experience in assisting clients with business advisory, development and planning issues. He also assists businesses and individuals from overseas in setting up in Australia, providing strategic financial know-how and applying his extensive knowledge of tax systems. 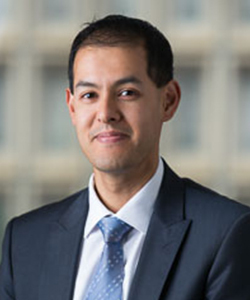 James regularly presents for the Institute of Chartered Accountants and is a Chartered Tax Advisor. For more information on these events, please do drop us a call!